For me anyway. Thanks Sandi, for telling me I better get busy and do a post. You are right. I do have a picture or two to share. This week has been crazy, which is why I haven't been blogging. I worked at the HS the last two days. It was fun, but tiring. I'm pretty much dead for the rest of the day after working my lunch lady job. On Sunday, after doing my post, I decided to take it easy and do a little project. 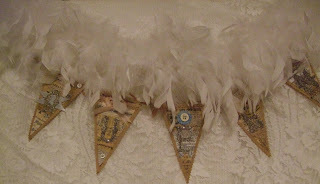 I was so inspired by seeing all the adorable things at Joy's house, that I decided to make a little banner of my own. This was my inspiration. 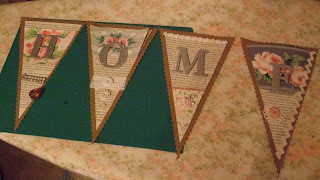 This banner was hangin in Joy's bedroom. She said it was made by artist, Karen Otto. I just love it. Kind of hard to see, but you can click on it for a close up. I am incredibly good at starting projects, (that's always the fun part for me) and terrible at finishing them ( think I have mentioned this before). I just get bored easily. Here is what I have managed to do so far. Nothing is glued down yet. 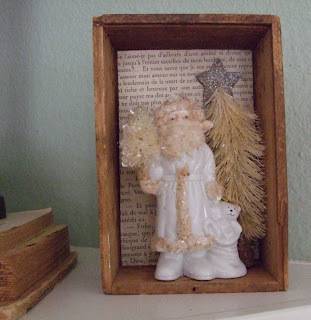 It was so fun putting all the papers and embellishments together. I cheated and got the letters from Target. You can get a whole bag for about $8.00 which I thought was a pretty good deal and easier than making them myself. I have to admit that most projects I show on my blog are not my original ideas. I wish I could say that they were. What I usually do, is find something I like, and try to figure out how to do it and make it my own. 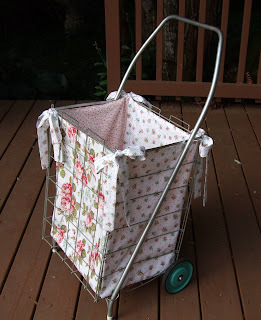 I definitely wasn't the first person to make shopping cart liners, but I like to think mine are special because of the fabrics I use and the way I put them together. Plus, they come with a neat shopping cart too. Isabel and I are always joking about how many liners we have made (she makes lovely ones too) and neither of us has one for our own shopping carts. Anyway, I find that I am constantly inspired by so many artists I see on blogs. Their originality and talent just amazes me. Here's a picture of a couple things I got at the Tarte/Apples & Antiques Holiday Sale last Saturday. 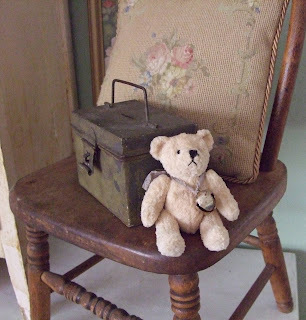 The little Santa box and the bear came from Martha at Vintage Trifles. She makes the most incredible things. One of the truly talented people that I admire. Cindy too, has such a nack for making ordinary things into works of art. I'm kicking myself right now for not taking any pictures at their sale. Isabel and I are going to have a "fun day" tomorrow. We will probably go shopping and maybe to a movie. I really need to do some holiday decorating. I just can't seem to get motivated. I have bought a few ornaments recently and they are just waiting patiently to be hung on my tree, which hopefully we will get this Saturday. 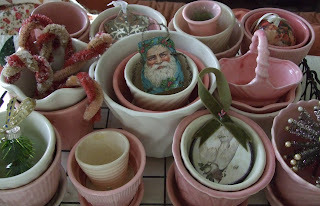 Here they are hanging out in some of my pottery collection. At least I will know where they are when the decorating begins. I have more pics to share with you of some thrifted finds, but I will save them for another post as this one is getting kind of long. Ohh! I just love Farm Chicks!!! I missed getting to go this year. Your banner (real not blog) looks really cute~sorry no help on the blog one. Doing the Farm Chicks show sounds exciting! I'm glad to hear that I'm not the only person with "completion" problems out here in Blogland. I've finally learned not to even start a project with more than two or three steps or one where I have to round up supplies and tools or if I have to go from store to store to find what I need. I love the planning process, but drop the ball at implementing. I'm certain you're not as bad as I am because I see some of your completed projects. I've had the same problems with my blog banner, it'd disappeared although the image is still there but only appears if i show it infront of the text?? I'm no help but if you find out the answer please let me know! PS The banner is great and I'm hoping to start work on my own shortly! All of my favs! I am way behind too! Darling Banner and carry basket!